In our house silliness prevails, particularly when it comes to the use of language. After Xander was born my wife started substituting "Platypus and Salamander" into those parts of the conversation normally occupied by "Atticus and Alexander". At this point each child has his own alter ego and logo to go with. 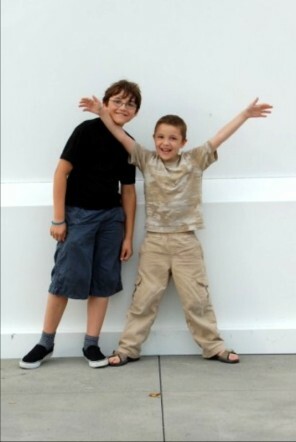 Our Story � the picture at left is of my two sons, Alexander and Atticus. My youngest son Alexander was diagnosed with Acute Lymphoblastic Leukemia in June of 2006. I am happy to report that Xander�my favorite nickname for him�has been clear of leukemia for almost four years now! With that said, I have put together a new blog to update you on my 2010 Boston Marathon Campaign, nicknamed "Meche Marathon". On this new blog you can read about how Xander is doing, follow my training runs, and help spread the word. Be sure to check out Meche Marathon 2010 Blog. Keep reading for a background and history of our family and the reasons why I continue to run the Boston Marathon. Three years ago Alexander was asked to be the patient partner of Robin Kievit, a caregiver affiliated with MassGeneral who was also a volunteer and fundraiser on the Marathon team. The night before the race, at the traditional spaghetti dinner I made a decision to try and become Alexander�s next partner if I could manage to get a place on the team. I bought some new shoes and hit the road. This is my third year on the team with Xander, my patient partner. I am in training and our whole family is conspiring to get me across that finish line in April. It probably comes as no surprise that my motivation for running this marathon is gratitude. 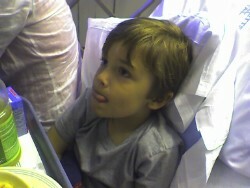 While Xander�s treatment protocol comes with no guarantees, I do believe that the folks at MassGeneral saved his life. Diagnosis day was like a kick in the gut�at first it was a struggle to even say the word leukemia�but it doesn�t take long for the parenting instinct to kick in. The transition to patient parent is quick but full of uncertainty and tears. Xander�s primary care physician tried in vain to reassure us but it wasn�t until we arrived at MassGeneral that we began to understand what we were facing. Immediately after arriving at the Pediatric Hematology / Oncology clinic and meeting Dr. Alison Friedman we began to gather some optimism. It is hard to describe in a few sentences but Dr. Friedman projected a sense of concern and care coupled with confidence and professionalism. Most notably she used the word cure easily and often. Over the next few hours we met more caregivers, members of Xander�s team, with a similarly determined and optimistic attitude. There is no mistaking the fact that these folks are in the business of curing cancer. As I understand it, the funds we raise will go directly to support the Cancer Care for Kids by supporting research into the causes of childhood cancer and to develop new treatments for these cancers. I would be most grateful if you would consider sending a gift. If you give through this website, the money will go directly to them. You can also mail me a check (made out to Massachusetts General Hospital) and I will pass it along. Thank you for visiting my Personal Fundraising Page. Donating through this site is simple, fast and totally secure. It is also the most efficient way to make a contribution to my fundraising efforts. Many thanks for your support -- and don't forget to forward this to anyone who you think might want to donate too! Copyright 2008 platypusandsalamander.com. All Rights Reserved.